Anyone who spends any time with me, or on joy magnetism, knows that I love museums. So you won't be surprised that I'm in the middle of this book, Old Masters, New World, all about how America's finest art collections were built. Basically, back in the late 1800s, the country was starting to rebuild after the Civil War, and people were beginning to realize that America had no real cultural institutions to visit. Understandable, we were a new country, and with other priorities. So, the wealthy of America began to collect. Whether it was Henry Clay Frick or J.P. Morgan or Isabella Stewart Gardner, America saw an influx of artwork from Europe and beyond. Last weekend, I finally got to visit the Isabella Stewart Gardner Museum in Boston. Basically, she collected so many pieces that she needed a place to put them, and so she began building her museum...the interior of which just happens to be done up in the form of a 15th century Italian palazzo. I. Love. This. Museum. Seeing the museum made the Old Masters book come alive for me, seeing the paintings and knowing how she came by them, or how much she paid, or where they came from. The collection is fantastic, and well laid out. Each room is chockful of stuff to look at and marvel over. But don't marvel too close, the guards at the museum are hyper alert to anyone getting too near the artwork, or opening their cell phones. For good reason, though, as the ISG was the target of an art heist in the 90s, where the thieves absconded with 13 pieces of art. A crime against civilization, they called it, and so the ISG leaves the empty frames in place, in hopes that the paintings find their way back home again. For as much as I loved the museum, I will say that the museum store - in the words of my 17-year-old cousin - was "like a grandmother's yard sale." I get it, it's probably not the tchotcke-buying clientele they want to attract, I guess. So of course, there was no extensive magnet selection to add to my magnet art gallery. But, I did manage to find this magnet at the counter, from an exhibition they did a few years ago about the bronze mat weights that she collected. Mat weights were used to quite literally, weigh down the floor mats at the corners, to keep them from moving. 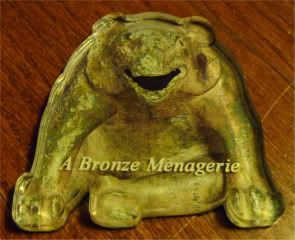 This bear is part of a set, one of the first that Isabella bought, and the largest anyone's found - they date back to somewhere around 206 BC to 9 AD. Dudes. BC. They called him a clumsy little bear, because he's stumbled off his paws and onto his bum. How cute! According to Isabella's friend who procured them for her: "You will find them endlessly delightful, as nice as real ones, only more." Oh my. Maybe I should get a bear mat weight of my own!